You observant ones and those in the know will by now realize the genesis for how I named the characters in Heaven’s Ant Farm. That’s right, they are the angels associated with the great religions. 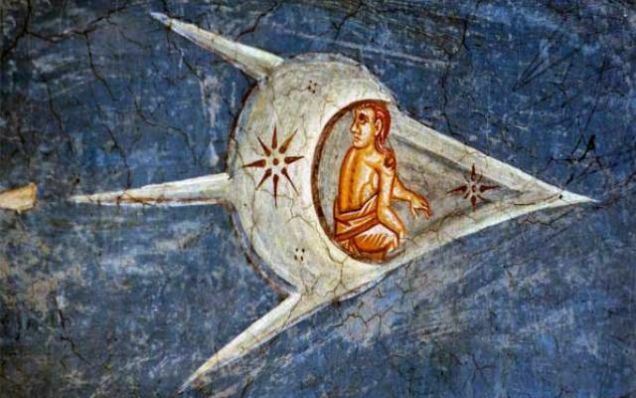 The meanings are all salient in Heaven’s Ant Farm where science mixes with religion—just like this medieval picture of an angel in what looks like a spaceship. For instance in Heaven’s Ant Farm Abram, the villager who meets Yahweh in the Garden of Eden and first hears his name, wonders about “such a strange and simple name that tells nothing about him or where he’s from.” This is a beautiful description of the Tetragrammaton. And Professor Yahweh Tabbris’ last name means Angel of Self Determination in Hebrew — the angel that presides over free will. And as for Dean Superior Maion Harahel (the grim nosed head dean of the Great Scientific University of Heaven) — Maion is the angel of self discipline and Harahel is a Hebrew name meaning angel of knowledge. Ramiel (Lucifer’s right hand man in Heaven’s Ant Farm) is a fallen angel in Hebrew literature (Daniel and Enoch) and Jehoel (Judge Jehoel, the chief elder presiding over the Grand Council of Heaven in Heaven’s Ant Farm) — is a name from apocryphal literature that means the angel who holds the Leviathan in check. Then there’s the taxonomist, Dr. Hayyel Manakel, who names the animals on the fifth day of the parallel universe’s existence — Hayyel means Angel of Wild Animals in Hebrew. And, of course, the name I cooked up— Korbibtor, the god of Lucifer and his fanatic followers. Can you figure out where I got that name? Not everyone will catch every reference but it was fun doing the research of these angels found in the great religions to see how they would play out in Heaven’s Ant Farm. You can, of course, Google the term “Angel Names” to access a wealth of information. Nevertheless, be prepared for a lot of inconsistencies but that’s OK for science fiction. I’ll post a link to my notes for all the angels that appear in Heaven’s Ant Farm and its sequel real soon.